Using ancient DNA, researchers have created a unique picture of how a prehistoric migration route evolved over thousands of years – revealing that it could not have been used by the first people to enter the Americas, as traditionally thought. The established theory about how Ice Age peoples first reached the present-day United States has been challenged by an unprecedented study which concludes that their supposed entry route was “biologically unviable”. 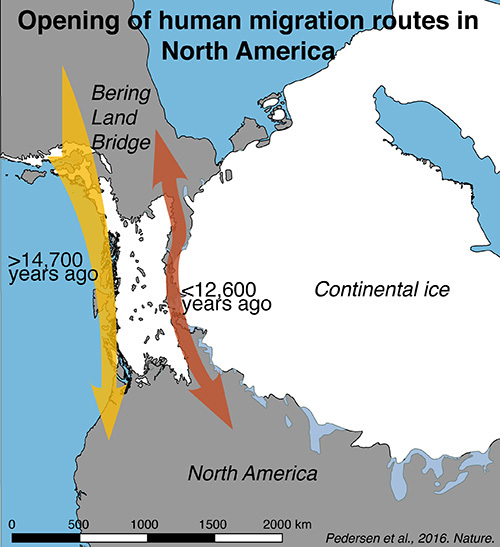 The first people to reach the Americas crossed via an ancient land bridge between Siberia and Alaska but then, according to conventional wisdom, had to wait until two huge ice sheets that covered what is now Canada started to recede, creating the so-called “ice-free corridor” which enabled them to move south. In a new study published in the journal Nature, however, an international team of researchers used ancient DNA extracted from a crucial pinch-point within this corridor to investigate how its ecosystem evolved as the glaciers began to retreat. They created a comprehensive picture showing how and when different flora and fauna emerged and the once ice-covered landscape became a viable passageway. No prehistoric reconstruction project like it has ever been attempted before. The researchers conclude that while people may well have travelled this corridor after about 12,600 years ago, it would have been impassable earlier than that, as the corridor lacked crucial resources, such as wood for fuel and tools, and game animals which were essential to the hunter-gatherer lifestyle. If this is true, then it means that the first Americans, who were present south of the ice sheets long before 12,600 years ago, must have made the journey south by another route. The study’s authors suggest that they probably migrated along the Pacific coast. Who these people were is still widely disputed. Archaeologists agree, however, that early inhabitants of the modern-day contiguous United States included the so-called “Clovis” culture, which first appear in the archaeological record over 13,000 years ago. And the new study argues that the ice-free corridor would have been completely impassable at that time. The research was led by Professor Eske Willerslev, an evolutionary geneticist in the Department of Zoology and Fellow of St John’s College, University of Cambridge, who also holds posts at the Centre for GeoGenetics, University of Copenhagen, and the Wellcome Sanger Institute in Cambridge. “The bottom line is that even though the physical corridor was open by 13,000 years ago, it was several hundred years before it was possible to use it,” Willerslev said. The corridor is thought to have been about 1,500 kilometres long, and emerged east of the Rocky Mountains 13,000 years ago in present-day western Canada, as two great ice sheets – the Cordilleran and Laurentide, retreated. On paper, this fits well with the argument that Clovis people were the first to disperse across the Americas. The first evidence for this culture, which is named after distinctive stone tools found near Clovis, New Mexico, also dates from roughly the same time, although many archaeologists now believe that other people arrived earlier. The conclusion reached by Willerslev and his colleagues is that the journey would have been impossible until about 12,600 years ago. Their research focused on a “bottleneck”, one of the last parts of the corridor to become ice-free, and now partly covered by Charlie Lake in British Columbia, and Spring Lake, Alberta – both part of Canada’s Peace River drainage basin. 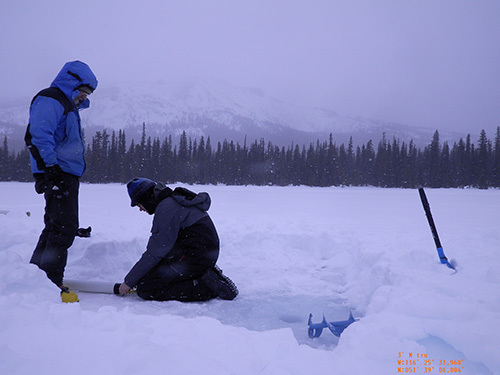 The team gathered evidence including radiocarbon dates, pollen, macrofossils and DNA taken from lake sediment cores, which they obtained standing on the frozen lake surface during the winter season. Willerslev’s own PhD, 13 years ago, demonstrated that it is possible to extract ancient plant and mammalian DNA from sediments, as it contains preserved molecular fossils from substances such as tissue, urine, and faeces. This approach allowed the team to see, with remarkable precision, how the bottleneck’s ecosystem developed. Crucially, it showed that before about 12,600 years ago, there were no plants, nor animals, in the corridor, meaning that humans passing through it would not have had the resources that were essential for their survival. Around 12,600 years ago, steppe vegetation started to appear, followed quickly by animals such as bison, woolly mammoth, jackrabbits and voles. Importantly 11,500 years ago, the researchers identified a transition to a “parkland ecosystem” – a landscape densely populated by trees, as well as moose, elk and bald-headed eagles, which would have offered crucial resources for migrating humans. Somewhere in between, the lakes in the area were populated by fish, including several identifiable species such as pike and perch. Finally, about 10,000 years ago, the area transitioned again, this time into boreal forest, characterised by spruce and pine. ​Inset images: Map outlining the opening of the human migration routes in North America revealed by the results presented in this study. / Mikkel W. Pedersen and colleague preparing for coring of the lake sediments. All images provided by Mikkel Winther Pedersen, Centre for GeoGenetics, Natural History Museum of Denmark, University of Copenhagen.